The sunken Norwegian frigate Helge Ingstad collided with a tanker off the Sture oil terminal on November 8. Despite attempts to keep the Helge Ingstad floating, the vessel ultimately sank near shore. 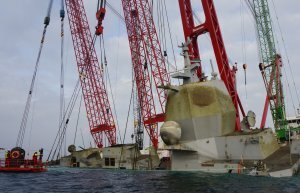 Salvage specialist Scaldis Marine Contractors NV lifted the vessel using a Double Duo Lift method. Eager.one received a request from Scaldis Marine Contractors NV for design, engineering, fabrication, testing and delivery of two double sheave blocks with a capacity of 900 tons each. At that moment no specific detail of the job were provided besides a hand sketch and the required capacity. A minor detail was the desirable delivery date of maximum 2 weeks, appearing to be an impossible mission. During the next contacts it became clear that these sheaves blocks would be used as equalizing sheaves in a rigging configuration to salvage the Norwegian KNM Helge Ingstad, a marine frigate that collided with a commercial vessel. As Eager.one recognizes itself as a true service provider in the industry embracing technical challenges it committed themselves to this challenging request, and after two days of intensive communications the work was awarded to Eager.one. A dedicated project team including devoted suppliers and fabricators was assigned, and the design and engineering team pick-up the activities in close cooperation with Scaldis’ project team in Belgium and Norway immediately. The same day Eager.one received the order to execute the works, materials could be ordered and engineering works were ongoing at full pace and drawings and calculations were submitted the day after. 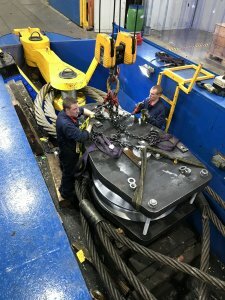 The next days were a continues carrousel of intensive communications with the client project team, fabricators and suppliers, and only seven days after receipt of the Purchase Order, the sheave blocks were tested under witness of Client and DNV-GL and loaded on the truck for transport to Norway the same day. The impossible was made possible! After a week Eager.one received a phone call from the project team again to support with design and fabrication activities for this unique salvage job. During a period of approximately three weeks, Eager.one continued to support Scaldis’ project team and performed design and engineering services, integrity checks of the hull and fabricated and delivered additional hardware for this high end, engineering based salvage job. 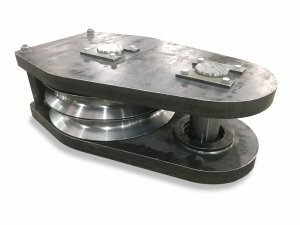 Need bespoke sheave blocks or other equipment fast? We cover all your needs. Please contact us.